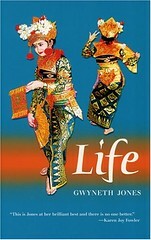 In Life, author Gwyneth Jones manages a delicate balancing act, showing the massive implications of a slight shift in the genes that control human gender while, at the same time, reminding readers that life goes on. Anna’s pursuit of Transferred Y happens against a backdrop of personal minutiae and career moves. She is a wife, a mother, an employee—and the years go by. She may be making a fantastic discovery, but that doesn’t render her immune to marital discord, tragedy or the aging process. Jones’ prose is deeply engaging, drawing readers fully into her near-future setting. Anna is a well-drawn protagonist, one who inhabits a role usually reserved for male characters in SF: the obsessed scientist, willing to make big sacrifices to unlock the mysteries of life. It is an intriguing portrayal, but also an alienating one: Anna is hard to like. Some of her personal difficulties create reader sympathy, making her harsher choices somewhat forgivable, but these also make the book—which is quiet and thoughtful in tone—quite bleak. Other reviews: David Soyka at SF Site and Cheryl Morgan in Emerald City. See also two essays by Jones about the development of the novel, “The Brains of Female Hyena Twins” and “True Life Science Fiction: Sexual Politics and the Lab Procedural“.